2018 marks the bicentennial of Mary Shelley's novel. 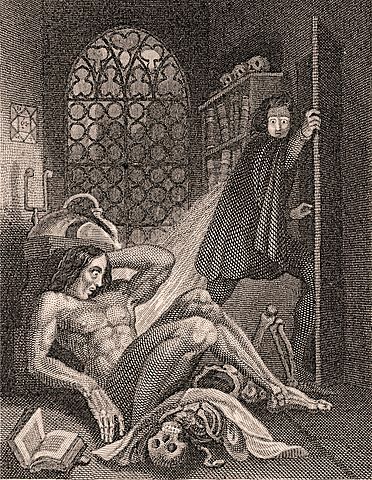 "Frankenstein, or The Modern Prometheus, was composed in the summer of 1816 by the 19-year-old Mary Wollstonecraft, later the wife of poet Percy Bysshe Shelley, during a vacation she spent on the shores of Lake Geneva with Shelley and their friend the poet George Gordon, Lord Byron. The weather was cold and rainy; to pass the time, she, Shelley, and Byron engaged in a contest to craft the best horror story. Published anonymously in 1818, Mary Shelley's gothic novel has continued to exert an influence on literature and popular culture for nearly 200 years." Lucas, D., & Lucas. (2009). Frankenstein, Legend of. In H. J. Birx (Ed. ), Encyclopedia of time: science, philosophy, theology, & culture. Thousand Oaks, CA: Sage Publications. Use the MSUB Library's databases to find college-level research material. Sign-in with your NetID & Password.